Asian longhorned beetle (ALB) is a serious pest with a broad host range. In North America, maple, boxelder, willow, elm, horsechestnut, buckeye and birch are documented as very good hosts. Other trees such as hackberry, ash, poplar and mountain ash are considered possible hosts as well as some trees not commonly found in Minnesota. In its native range, ALB is most commonly found on poplar and is considered a minor to occasional pest. Trees attacked in North America are eventually killed due to heavy larval tunneling within the tree. New infestations are started by moving infested wood to new places where the beetles exit the wood and move on to trees in the area. 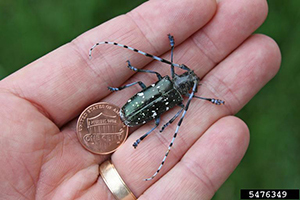 Asian longhorned beetle is a federally regulated pest due to the severe economic and environmental impacts it inflicts. When ALB has been found in new areas, a federal quarantine and eradication program have been initiated. These are serious measures, but preferable to the impacts of an ALB infestation left unchecked. Asian longhorned beetle is native to eastern Asia. The first trees found infested with ALB in North America were in Brooklyn, NY in 1996. Since then, ALB has also been found elsewhere in New York City and nearby in New Jersey and Long Island. Asian longhorned beetle was also discovered in Chicago, IL in 1998, Toronto, ON in 2003, Worcester, MA in 2008, Boston, MA in 2010 and Bethel, OH in 2011. In all locations where ALB has been discovered, an eradication strategy has been undertaken. In Chicago the strategy has been effective, and ALB was declared eradicated there in 2008. This pest has never been found in Minnesota. Asian longhorned beetle adults are present during the summer when they feed on leaves and twigs of host trees. After mating, females chew egg niches (shallow pits) in the bark of live trees, laying an egg in each niche. After the eggs hatch, the larvae tunnel under the bark of the tree and eventually tunnel deep into the wood as they mature. An individual spends the winter as a larva and may spend one to two years within the same tree. Once larval feeding is complete, the larva will pupate into an adult during the spring/early summer and exit the tree, restarting the cycle. Asian longhorned beetle adults are fairly recognizable with their large size, long antennae and distinct coloration (black with up to 20 distinct but irregularly shaped white spots). However, there is a common native insect in Minnesota, the white-spotted sawyer (Monochamus scutellatus), that could be confused with ALB. The difference is a distinct white spot just behind the pronotum (area behind the head) of the sawyer – this white spot is not found on the ALB. Additionally, spots on the wing covers of sawyers are less distinct than on ALB. When ALB adults exit trees they create dime-sized holes that are perfectly round. Other wood-boring insects may create exit holes that appear similar but they are likely to be in dead or dying trees – one indicator that it may be the ALB is the presence of exit holes in live trees. The egg niches created by ALB females are also roughly the size of a dime, but are more oval in shape. Since the ALB attacks live trees, sap may be seen weeping down the bark under an egg niche. Asian longhorned beetles are present within trees and will not be visible as larvae. As they tunnel in trees they will expel sawdust out of their galleries. The sawdust may be visible on the upper sides of branches or near the base of the tree. Dodds K and Orwig D. 2011. An invasive urban forest pest invades natural environments – Asian longhorned beetle in northeastern U.S. hardwood forests. Canadian Journal of Forest Resources.41:1729-1742. Hu J, Angeli S, Schuez S, Luo Y and Hajek A. 2009. Ecology and management of exotic and endemic Asian longhorned beetle Anoplophoa glabripennis. Agricultural and Forest Entomology. 11: 359-375. Asian Longhorned Beetle – UVM Entomology Research Laboratory.